"As President Trump has said, in his words, it is not enough to merely have an American presence in space — we must have American dominance in space," Pence said at the Pentagon Thursday. 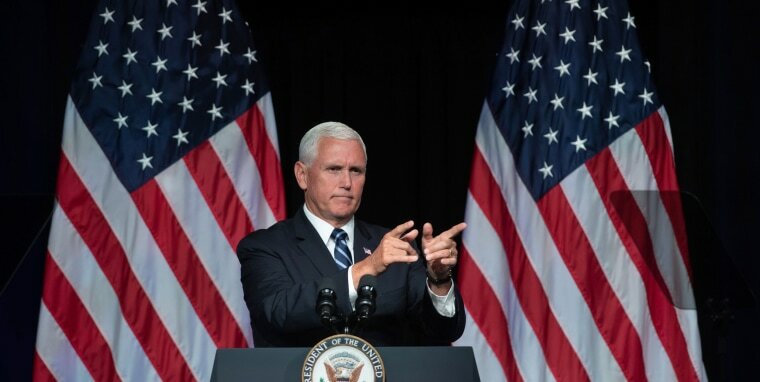 Vice President Mike Pence on Thursday laid out details for President Donald Trump's proposed new branch of the U.S. military — responsible for protecting national security in outer space. In a speech at the Pentagon, Pence said the new Space Force would be established by 2020. "As President Trump has said, in his words, it is not enough to merely have an American presence in space — we must have American dominance in space. And so we will," Pence said. "Space is, in his words, a war-fighting domain just like land and air and sea." He added, "History proves that peace only comes through strength, and in the realm of outer space, the United States Space Force will be that strength in the years ahead." If it happens, the Space Force would become the sixth branch of the U.S. Armed Forces, equal to the other five, Pence said. The Department of Defense released a 15-page report Thursday laying out the phases of creating the new branch, which will ultimately need to be approved by Congress. The report said that the Pentagon would "usher in a new age of space technology" in order "to deter and if necessary degrade, deny, disrupt, destroy, and manipulate adversary capabilities to protect U.S. interests, assets, and way of life." Pence highlighted efforts by countries such as Russia and China, which have bolstered efforts to develop space weapons and technology, and argued the U.S. must exceed their efforts to have dominance in space. "As their actions make clear, our adversaries have transformed space into a war-fighting domain already, and the United States will not shrink from this challenge," Pence said. The technology and weaponry highlighted by Pence and in the Defense Department report include anti-satellite weapons, which could disable or destroy satellites, technology to jam military communications, and the enhancement of radar and GPS capabilities. Shortly after Pence's speech, Trump tweeted his support: "Space Force all the way!" The president's campaign also sent supporters an email asking them to vote on a Space Force logo. The campaign then asked those who voted to consider a campaign donation "to support the President as he implements Space Force." The Space Force would not be created from scratch, but rather begin by re-organizing existing space programs and personnel. It would initially be led by a civilian who would report directly to the Secretary of Defense, Pence said. According to the report, the new effort would include the Space Development Agency, which will focus on development; the Space Operations Force, which will include "space warfighters"; Services and Support, which will be comprised of leadership support; and the Space Command, which will be led by a four-star general. The report added that it would create a legislative proposal for Congress for the 2020 budget cycle to merge each of those units to create the Space Force as a sixth branch. Trump initially drafted the idea of creating a Space Force in March, saying he originally came up with the name as a joke. "I said, 'Maybe we need a new force, we'll call it the Space Force,' and I was not really serious," he said in a speech to service members at the Marine Corps Air Station Miramar in California. "Then I said, 'What a great idea, maybe we'll have to do that.'" In June, the president ordered the Pentagon to immediately begin the process of developing a space force. However, in October 2017, Defense Secretary James Mattis said in a letter to Congress that he did not back the idea, citing military budget concerns. “I opposed the creation of a new military service and additional organizational layers at a time when we are focused on reducing overhead and integrating joint warfighting functions,” he wrote. Capt. Mark Kelly, a former NASA astronaut and the husband of Gabrielle Giffords, also criticized the idea on Thursday, calling it wasteful and unnecessary because the Air Force Space Command, also known as the U.S. Space Command, does much of the same work. "It doesn't make sense to build a whole other level of bureaucracy in an incredibly bureaucratic DoD," Kelly told MSNBC. "The only person that I’ve heard say this is a fantastic idea is the commander in chief, the president of the United States. Everybody else says it’s redundant, it's wasteful."